Indiana University Distinguished Professor Hal E. Broxmeyer, PhD, is the recipient of a highly competitive National Heart, Lung, and Blood Institute Outstanding Investigator Award to continue his 35 years of groundbreaking research into lifesaving umbilical cord blood transplantation. Dr. Broxmeyer, an internationally recognized scientist, received a seven-year, $5.4 million grant to continue his research into how to maximize the use of adaptable blood-forming cells in cord blood for transplantation for certain types of cancer, metabolic and blood diseases. Dr. Broxmeyer has focused on expanding the effectiveness of cord blood since 1983 when he and colleagues first proposed the concept of using umbilical cord blood as an alternative source of hematopoietic stem cells for transplant. 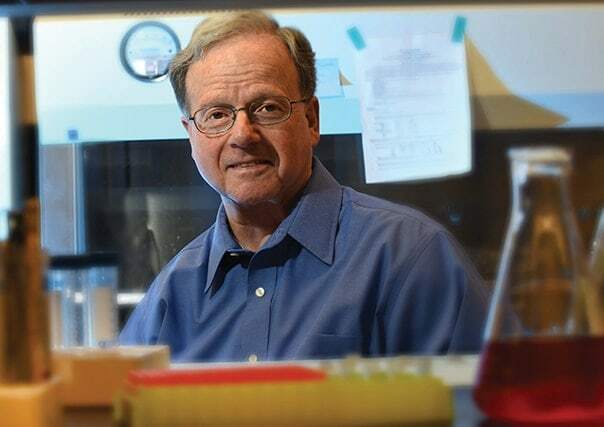 In 1988, his lab processed the blood used in the first successful umbilical cord blood transplant in Paris and the cord blood used in subsequent transplants in Baltimore, Cincinnati and Minneapolis. The first treatment for a 5-year-old boy with the blood disorder Fanconi’s anemia was a success, and five of the six subsequent cord blood transplants were successful. Over the years, the Broxmeyer lab has worked on finding solutions to issues that limited the use of cord blood for transplant. One key problem that restricted its use for transplant in large children or adults was the limited number of stem cells collected from one umbilical cord. However, his team published a remarkable finding in the journal Cell in 2015 that found that the numbers of stem cells in bone marrow and umbilical cord blood had been grossly underestimated because they are typically collected in ambient air that has an oxygen level of about 21 percent. By collecting blood in a more controlled environment with lower oxygen levels, they determined that many more useable stems cells could be harvested. Dr. Broxmeyer is a professor of microbiology and immunology, the Mary Margaret Walther Professor Emeritus and chairman emeritus of the Department of Microbiology and Immunology at IU School of Medicine. He is also a co-leader of the hematopoiesis and malignant hematology research program at the Indiana University Melvin and Bren Simon Cancer Center.